Looking for a vegan comfort food that will fool even the most die-hard meat eaters (I have proof!) and provide you with a week's worth of meals? Then you must try this recipe ASAP. Imagine taking a shortcut to lasagna, but with all the same delicious flavors and heartiness. Yum! What surprised me most about this dish was how non-vegan it tasted. Yes I know, that is the point of this blog...but I was really blown away, perhaps more than any other recipe I've made so far. There was no lingering flavor of any "faux" ingredients. My meat-eating friend tried some very hesitantly, but then quickly gobbled it up. He even raved about how good it was, and how "regular" it tasted...fake meat, cheese, and all. I was amazed! 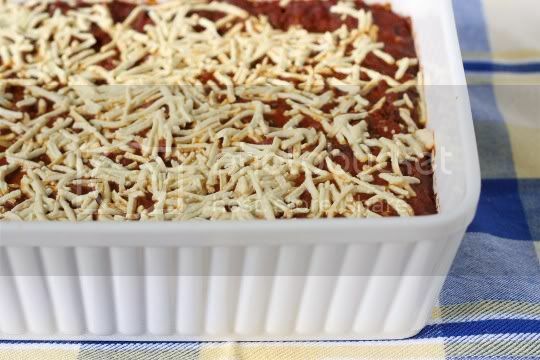 The dish is relatively easy to make, compared to, let's say, an actual lasagna. 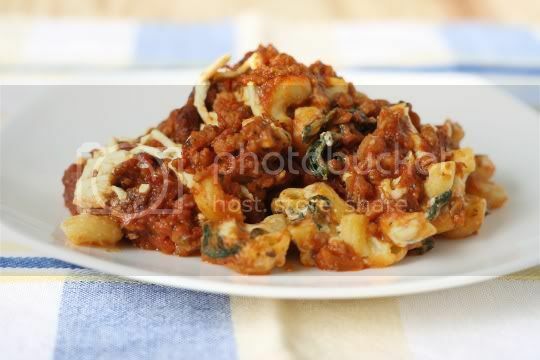 The meat sauce is simply sauteed faux grounds mixed with your favorite marinara sauce (so use a good one), and it seeps down into the cooked noodle base making everything lasagna-like. I used elbow noodles, but something like shells would probably be equally as good. Daiya mozzarella combined with sour cream makes the pasta gooey and creamy. I used Wayfare for the sour cream, a relatively new product on the vegan market, which is totally different from the Tofutti Sour Cream I've been using. Either one will work, but I think the Wayfare won't have as much of a soy undertone. It has a strange texture, slightly gritty and more gelatinous, but it's tangier, tastes a little better overall, and works wonders in this recipe. The nutritional yeast adds an aged, umami flavor that is just too good. I only added 1/4 cup, but double that if you're a nooch fan. The finished product is so amazing, and everything you'd want in a main dish: filling, savory, creamy, and rich. It's the vegan's total comfort food. As decadent as the dish is, one portion is surprisingly decent on the nutritional scale. Serve this up with a side of crusty, buttery garlic bread and a glass of red wine. Mama mia! Preheat oven to 350. Cook noodles until al dente; drain and set aside. In a large nonstick skillet, add grounds, garlic, salt, and pepper, stirring frequently until heated through and slightly crisp, about 10 minutes. Add marinara sauce and Italian seasoning, stirring until well combined. Remove from heat. 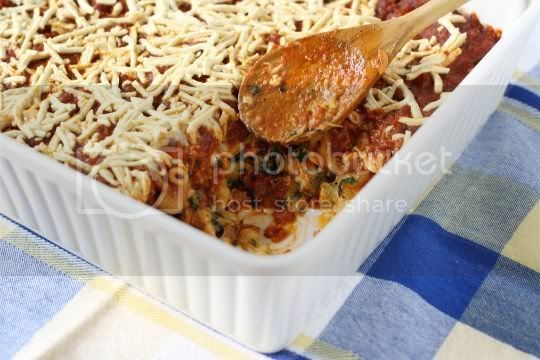 In a large bowl, combine cooked noodles, spinach, 1 cup shredded cheese, sour cream, nutritional yeast, and garlic powder. 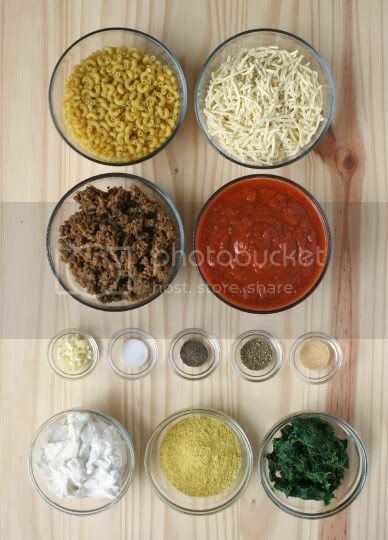 Stir until ingredients are evenly distributed and noodles are well coated. Spoon mixture into a lightly greased 13x9-inch baking dish. Top evenly with marinara mixture and remaining cheese. Bake uncovered for 30 minutes, or until bubbly around the edges. Let stand for 15 mins before serving. Serves 8. Nutritonal data (per 1/8th serving): Calories 339, Fat 12g (Saturated Fat 5g), Sodium 989mg, Carbs 44g, Fiber 8g, Protein 17g. I'm trying this tonight with lentils instead of the fake meat! It looks so yummy!